How solar panel work is a question that many owners and potential owners of solar panels often wonder about. Essentially solar panels consist of a number of solar cells that directly convert solar energy to D. C. Power. These cells are made of semiconductors that generate electricity when they absorb light. Solar cells represent the fundamental power conversion unit of a photovoltaic system. The solar cell operation is based on the ability of semiconductors to convert sunlight into electricity by exploiting the photovoltaic effect. In the conversion process, the incident energy of the light created mobile charged particles in the semiconductor that are then separated by the device structure and produce electrical current. The cells basically made from a thin (0.25mm) wafer of high purity silicon crystal. When light falls on the front of the cell, it produces mobile negative and positive charges called electron-hole pairs throughout the wafer. Some of these charges re-combine, releasing heat. Those that survive are separated by the electric field that exists at the p-n junction, so that the electrons flow towards the negative contact and the holes towards the positive. A typical 4-inch diameter crystalline solar cell or a 10cm x 10cm multi-crystalline cell can provide 1-1.5W of electrical energy under Standard Testing Condition, while the operating voltage is 0.5-0.6V. Since there are a few appliances that can operate at this low voltage, the immediate solution is to connect the solar cells in series to form a module. The physical assembly of modules with supports is called an array. Cells in parallel are arranged to get the desired current, while the cells are arranged in series to get desired voltage. Groups and subgroups of cells are added together as required to obtain the voltage and current requirements. In parallel connection, if a cell shorts, output of the whole row of the cells tends to feed current into the shorted cell. If the cell is open circuited, it has little effect. In case of series connection, a shorted cell in series string has minimum effect while an open cell results in power loss of the series string of the cells. The connection has both series and parallel group of cells is called Preferred Interconnection, is optimum considering the effect of cell shorting, unequal cell I-V characteristics and non-uniform illumination. This type of connection has the fewest number of shunt diodes, this connection gives highest array reliability. Diodes are placed across cells to force current through them and reduce hot spot temperature rise problems of shaded cells. Most PV manufacturers have standard configurations for modules that can work with 12V batteries. Allowing for some over voltage to charge the battery and to compensate for lower output under less than perfect conditions, it is found that 36 cells in series in a module can ensure a reliable operation. The modules are connected in series strings, the positive terminal of one to the negative terminal of the next, to provide the required voltage. A number of strings are then paralleled to provide the required power. The solar arrays convert the insulations of the Sun to useful DC electric power. The blocking diode lets array generated power flow only towards battery or grid. When the power generated by the solar cell array is more than required by the local load, it is used to charge the battery. The inverter is provided (solid state) to convert battery bus voltage to AC of frequency and phase to match with that of grid so that the system can be integrated. Solar Voltaic Arrays can be Flat Plat Arrays or Concentrating Arrays. They may be fixed arrays or tracking arrays where they are mechanically always kept perpendicular to Sun array line. Generally flat plat types of arrays are used. Concentrating type of arrays need tracking arrangement and cost is more. A solar panel consists of different layers to protect its internal materials and make high light transmission to the internal cells like: Glass layer, EVA layer, Back-sheets, Frame, Junction Box and Connector. These all protect the cells from UV rays of Sun, environmental hazards, moisture, weather, anti aging and make easy way to pass the light into cells and keep the structure perfect. Mono-crystalline, Poly or Multi-crystalline and Amorphous or Thin Film are the most commonly used solar cells over the world. These three has different characteristics based on their crystalline. Mono-crystalline cell has high efficiency and long life span. This is most popular and widely used. Multi-crystalline cell can absorb solar radiation in different angles. But it has lower life span than mono-crystalline cells. Thin Film cell has low manufacturing cost, but it also has low efficiency and life span. Also it has some re-cycling problem, so this is not more environment friendly. 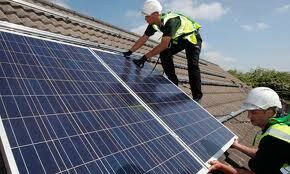 Solar panel is the great invention of modern technology and it has various advantages to use our regular life. Because the solar panel needs little maintenance, have longer life, do not create pollution problem, energy source is unlimited, easy to fabricate, made from raw materials which are easily available in larger quantities.